A Rube Goldberg Machine is defined as an "exceedingly complex devices that perform simple tasks in very indirect and convoluted ways"
One example would the the simplfied pencil sharpener. 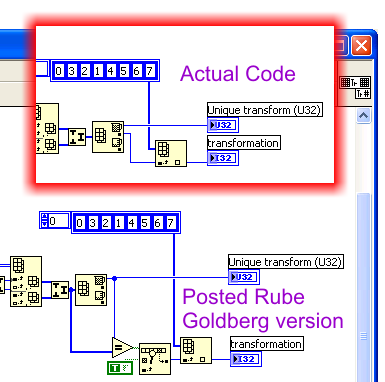 Let's define Rube Goldberg Code as ""exceedingly complex LabVIEW code that perform simple tasks in very indirect and convoluted ways"
For example, let's have a look at the code to test if two booleans are equal. Just beautiful! Unfortunately, the beauty of this is lost to most of you. To test this point, I have recently posted an obvious joke to see if anyone actually pays attention.... Apparently not!!! Nobody commented on my example that I snuck into the tic-tac-toe discussion. For comparison, here's my actual code detail compared to the posted image. Duuhhh!!! Anyway, I am sure that most of you have some great examples of such code. This thread is the place to share the fun! I am not really looking for intentional constructs (anybody can do that!). The focus should be more on existing serious code where you suddenly noticed that there is a much simpler way. You'll all be happy to know this person no longer works at NI. When I was "wee-G-Babe" I wanted to sort folders based their size. I did not know about the "Cluster Sort" method so I coded up a variation on a bubble sort. Greg McKaskle said he was stumped for a while but eventually figured it out. This was one of the first "Bad" from the "Good the Bad and the Ugly" series. I am one of those sick bastards that actually enjoys straightening other people's spaggetti. I have seen some impressive examples of Goldburg constructs. Recently I ran across the gem in the top illustration. To the guy's credit, in the original code the selects were nowhere near eachother. The equality, however, is inexcusable. Disclaimer: I am guilty of this sort of thing too. In fact, some examples I have posted have glaring Goldbergs. Altenbach, you have such an established guru reputation that I am sure many people assumed there was some obscure reason why you set the example up that way. Especially in the highly optimized enviornment of a coding challenge. I think I saw a variation of this in PRIME.vi posted yesterday. As a bonus, it also contains Darren's construct inside the case structure. So how do we go about constructive criticism in these cases? I am sure a few nudges in the right direction can make a big difference. Still I am impressed that people with no obvious LabVIEW or general programming background can get a fully working program together. PS which code was faster (first post)? For example here chutla's implementation and the elegant solution of mine. Do they still teach how to make truth tables? Launch LabVIEW 8.0 (7.1 doesn't allow browsing web examples). Browse into Fundamentals - Arrays and Clusters. Scroll to the bottom of the list and you'll see a few examples with globe icons and an orange user icon which indicate they were submitted by external users. Among the 10 or so user-submitted examples in this category are two that are particularly noteworthy. Before opening them, think about how you'd write a VI with this name... For me, I was thinking Array Size followed by Index Array if you wanted them as scalars. Both of the above VIs are equally effective, but I'm not sure that's how I'd teach someone to do it. Definitely not too efficient. I posted a method to copy the contents of a cluster to another cluster. In this thread I posted a method to copy the contents of a cluster to another cluster.